By this point I’m hoping the majority of you have filed your federal income tax return for last year. Today is April 15th, but you technically still have until the 18th to file this year. For those of you that have filed you are likely wondering where exactly your refund is at. When will you get it? How fast is the normal turn around on tax filings? You’re looking to track your progress through the government’s system so you can anticipate the money landing in your bank account. The IRS has a multitude of options that can be used to check your tax return’s status. 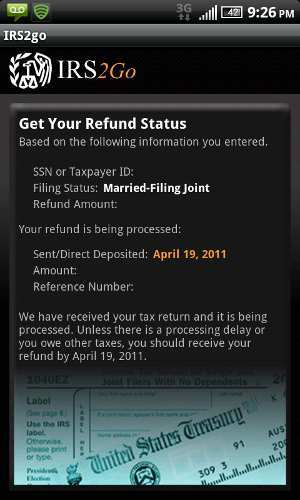 The most common is to go to Where’s My Refund?, the official government site used to check your filing status online. If you don’t have internet access or can’t seem to get the website to work you can always call the IRS Refund Hotline at 800-829-1954 or the IRS TeleTax System at 800-829-4477. You can even use the Internal Revenue Service’s handy iPhone or Android app (and yes, it works beautifully). Was My Tax Return Accepted? The easiest way to tell if your return was accepted or not is if your tax software gives you a Declaration Control Number (DCN). This is a 14 digit code that is generated with a majority of e-filing software after your return has been accepted. You can check to see whether or not your return was processed through the IRS options above. The website and phone application are the fastest and easiest methods to finding out. If you login to Where’s My Refund? you get a similar message in plain text on the webpage. If you e-file online and select the direct deposit option you will normally get your refund within 10 business days of your return being accepted. That’s pretty fast by any standard, especially government standards. If you e-file but get a paper check it might take a little bit longer, but nothing like filing a paper return and waiting on a paper check back. I would definitely recommend e-filing with a direct deposit if you are expecting a refund. I got my refund wired to me in about 10 days after i e-filed. I had never done that before and i was really shocked to receive it so quickly.